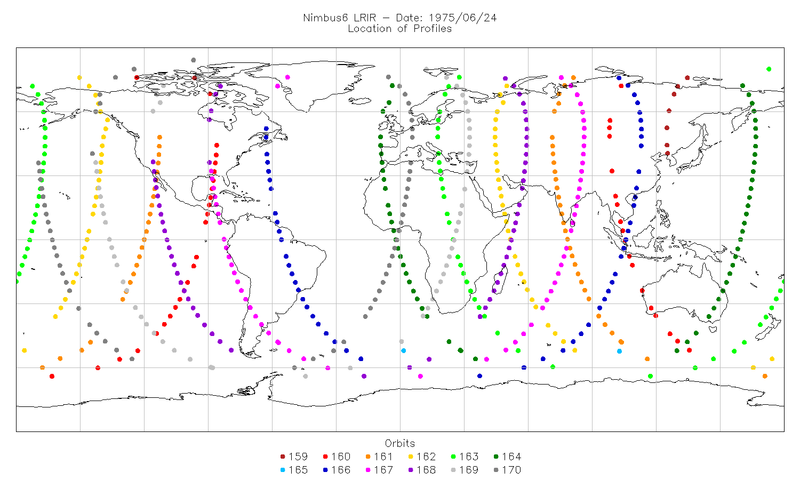 LRIRN6L2IPAT is the Nimbus-6 Limb Radiance Inversion Radiometer (LRIR) Level 2 Inverted Profiles of Temperature and Ozone data product. The product contains daily profiles of temperature and ozone concentration profiles that were inverted from radiances measured in four spectral regions: two in the 15 micron carbon dioxide band; one in the 9.7 micron ozone band; and one located in the rotational water vapor band (23 to 27 microns). The calibrated radiances are also included in this product. There are a maximum of 13 orbits per day each with up to 115 profiles per orbit. LRIR is a limb profiler with spatial coverage from latitude -64 to +84 degrees. Vertical profiles are provided at 17 standard pressure levels (from 100 to 0.1 mbar, i.e., from 15 to 64 km) with about 1.5 km vertical resolution. The instrument operated successfully and data are available from 20 June 1975 to 6 January 1976. After this, the detector temperature began to rise rapidly, and the instrument was turned off. The principal investigator for the LRIR experiment was Dr. John Gille from NCAR. This product was previously available from the NSSDC with the identifier ESAD-00037 (old ID 75-052A-04A). The data should be used with care and one should first read the Nimbus-6 User's Guide. Users should cite this data product in their research. Author(s) J.C. Gille, and House F.B. Typical data coverage of a Nimbus 6 LRIR data file. Use the Earthdata Search Client (EDSC) to find and retrieve data sets across multiple data centers.